Gao, Ruixuan, Shoh M. Asano, Srigokul Upadhyayula, Igor Pisarev, Daniel E. Milkie, Tsung-Li Liu, Ved Singh, et al. Cortical Column and Whole-Brain Imaging with Molecular Contrast and Nanoscale Resolution. Science 363, no. 6424 (January 18, 2019): eaau8302. doi: https://doi.org/10.1126/science.aau8302. Jassim, A. H., & Inman, D. M. (2019). Evidence of Hypoxic Glial Cells in a Model of Ocular Hypertension. Investigative Ophthalmology and Visual Science, 60(1), 1-15. doi: 10.1167/iovs.18-24977. Keyhanmanesh, R., Hamidian, G., Alipour, M. R., & Oghbaei, H. (2019). Beneficial effects of dietary nitrate on testicular injury by improving glycemia and inhibiting apoptosis in Streptozotocin-induced diabetic male rats. Reproductive BioMedicine Online. doi: https://doi.org/10.1016/j.rbmo.2018.11.027. Leibowitz, J. A., Natarajan, G., Zhou, J., King, M. A., Carney, P. R., & Ormerod, B. K. (2019). Sustained somatostatin gene expression reverses kindling-induced increases in the number of dividing Type-1 neural stem cells in the hippocampi of behaviorally responsive rats. Epilepsy Research. doi: https://doi.org/10.1016/j.eplepsyres.2019.01.005. Minakaki, G., Canneva, F., Chevessier, F., Bode, F., Menges, S., Timotius, I. K., . . . Klucken, J. (2018). Treadmill exercise intervention improves gait and postural control in alpha-synuclein mouse models without inducing cerebral autophagy. Behavioural Brain Research. doi: https://doi.org/10.1016/j.bbr.2018.11.035. Bailey, R. A., Gutierrez, A., Kyser, T. L., Hemmerle, A. M., Hufgard, J. R., Seroogy, K. B., . . . Williams, M. T. (2019). Effects of Preweaning Manganese in Combination with Adult Striatal Dopamine Lesions on Monoamines, BDNF, TrkB, and Cognitive Function in Sprague–Dawley Rats. Neurotoxicity Research. doi: 10.1007/s12640-018-9992-1. Prorok, T., Jana, M., Patel, D., & Pahan, K. (2019). Cinnamic Acid Protects the Nigrostriatum in a Mouse Model of Parkinson’s Disease via Peroxisome Proliferator-Activated Receptorα. Neurochemical Research. doi: 10.1007/s11064-018-02705-0. Sharman, M. J., Gyengesi, E., Liang, H., Chatterjee, P., Karl, T., Li, Q.-X., . . . Münch, G. (2019). Assessment of diets containing curcumin, epigallocatechin-3-gallate, docosahexaenoic acid and α-lipoic acid on amyloid load and inflammation in a male transgenic mouse model of Alzheimer’s disease: Are combinations more effective? Neurobiology of Disease, 124, 505-519. doi: https://doi.org/10.1016/j.nbd.2018.11.026. Singh-Bains, M. K., Mehrabi, N. F., Sehji, T., Austria, M. D. R., Tan, A. Y. S., Tippett, L. J., . . . Faull, R. L. M. (2019). Cerebellar degeneration correlates with motor symptoms in Huntington’s disease. Annals of Neurology, 0(ja). doi: 10.1002/ana.25413. Ton, S. T., Tsai, S.-Y., Vaagenes, I. C., Glavin, K., Wu, J., Hsu, J., . . . Kartje, G. L. (2019). Subventricular zone neural precursor cell responses after traumatic brain injury and binge alcohol in male rats. Journal of Neuroscience Research, 0(0). doi: 10.1002/jnr.24382. Csajbók, É. A., Kocsis, Á. K., Faragó, N., Furdan, S., Kovács, B., Lovas, S., . . . Tamás, G. (2019). 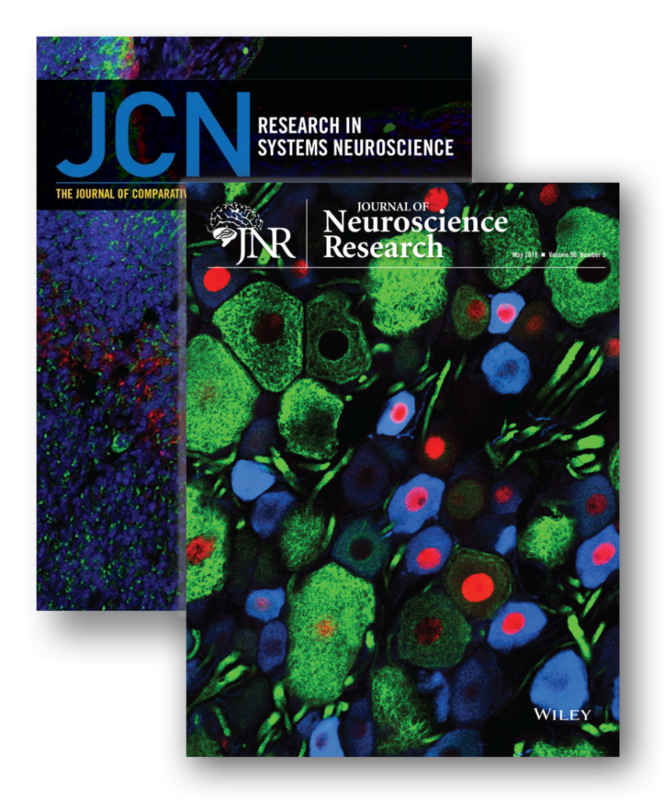 Expression of GLP-1 receptors in insulin-containing interneurons of rat cerebral cortex. Diabetologia. doi: 10.1007/s00125-018-4803-z. Jacques, A., Chaaya, N., Hettiarachchi, C., Carmody, M.-L., Beecher, K., Belmer, A., . . . Johnson, L. R. (2019). Microtopography of fear memory consolidation and extinction retrieval within prefrontal cortex and amygdala. Psychopharmacology. doi: 10.1007/s00213-018-5068-4. Jáidar, O., Carrillo-Reid, L., Nakano, Y., Lopez-Huerta, V. G., Hernandez-Cruz, A., Bargas, J., . . . Arbuthnott, G. W. (2019). Synchronized activation of striatal direct and indirect pathways underlies the behavior in unilateral dopamine-depleted mice. European Journal of Neuroscience, 0(ja). doi: 10.1111/ejn.14344. Li, Z., Jagadapillai, R., Gozal, E., & Barnes, G. (2019). Deletion of Semaphorin 3F in Interneurons Is Associated with Decreased GABAergic Neurons, Autism-like Behavior, and Increased Oxidative Stress Cascades. Molecular Neurobiology. doi: 10.1007/s12035-018-1450-9. Morris-Schaffer, K., Merrill, A. K., Wong, C., Jew, K., Sobolewski, M., & Cory-Slechta, D. A. (2019). Limited developmental neurotoxicity from neonatal inhalation exposure to diesel exhaust particles in C57BL/6 mice. Particle and Fibre Toxicology, 16(1), 1. doi: 10.1186/s12989-018-0287-8. Schafer, S. T., Paquola, A. C. M., Stern, S., Gosselin, D., Ku, M., Pena, M., . . . Gage, F. H. (2019). Pathological priming causes developmental gene network heterochronicity in autistic subject-derived neurons. Nature Neuroscience. doi: 10.1038/s41593-018-0295-x. Wang, L., Pang, K., Han, K., Adamski, C. J., Wang, W., He, L., . . . Zoghbi, H. Y. (2019). An autism-linked missense mutation in SHANK3 reveals the modularity of Shank3 function. Molecular Psychiatry. doi: 10.1038/s41380-018-0324-x. Yew, W. P., Djukic, N. D., Jayaseelan, J. S. P., Walker, F. R., Roos, K. A. A., Chataway, T. K., . . . Sims, N. R. (2019). Early treatment with minocycline following stroke in rats improves functional recovery and differentially modifies responses of peri-infarct microglia and astrocytes. Journal of Neuroinflammation, 16(1), 6. doi: 10.1186/s12974-018-1379-y. Li, G., Gong, J., Liu, J., Liu, J., Li, H., Hsu, A.-L., . . . Xu, X. Z. S. (2019). Genetic and pharmacological interventions in the aging motor nervous system slow motor aging and extend life span in &lt;em&gt;C. elegans&lt;/em&gt. Science Advances, 5(1), eaau5041. doi: 10.1126/sciadv.aau5041. Posted in Customer News, Software and tagged citations, Customer Research, Neurolucida, neurolucida 360, Neurolucida 360 customer research, Neurolucida Case Studies, Neurolucida Customer Research, Stereo Investigator, Stereo Investigator Case Studies, Stereo Investigator Customer Research, wormlab, Wormlab Case Studies, wormlab customer research.